And, I think I'm finished. Eleven different characters drawn and painted in TRON glory, haha. Two of the characters weren't mine, and my twelfth drawing I never finished. This character is Sue, and she doesn't belong to me, but to my buddy Sarah. I love Sue because she's funky and doesn't let anyone stand in her way. The way she dress reminds me of me, so I love her even more. She's also my weight and my height, so yippee! I had to think about Sue's light suit; I wasn't sure how I wanted to design it. In the end I tried to make it incredibly asymmetrical, and I almost added a skirt. Actually, I was dead set on adding a skirt, and then I inked it and felt silly because I totally forgot the skirt. OH WELL. Sue rocks my socks. 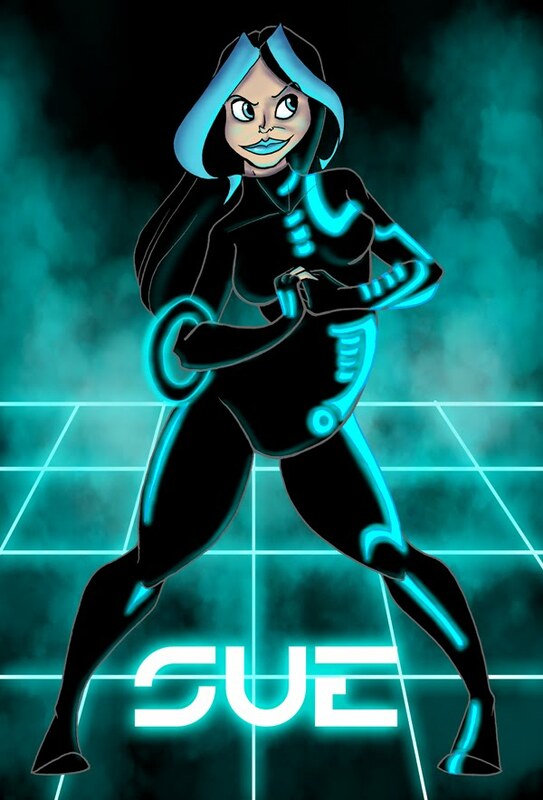 I'm a little sad because despite my TRON binge I only drew one civilian/muse style program, and all of the others (including myself) were Gladiators. If I get bored again I might draw Suka, but she strikes me more of an Iso type than a program. Think it's time to move forward and draw some more personal work.